In the world of “fake news” and “alternative facts”, it is important that we dig a little deeper than the headlines to understand the world around us and to avoid a distorted view those in power often want to give us. Ironically, the same is true at the microscale. I recently ran into some work concerning the effects of sample prep on x-ray measurements. It made me reflect on some early work we did to explore the effects of sample prep on EBSD results. In order to prepare EBSD samples properly it is important to understand that surface finish is not the whole story. It is important that the layer of material sampled by EBSD be distortion free. Charts shown in many metals preparation handbooks clearly show that there can be significant deformation imparted into the sub-surface of a material during preparation. Consider the following chart adapted from a figure in a classic EBSD sample preparation paper: D. Katrakova & F. Mücklich (2001) “Specimen preparation for electron Backscatter Diffraction. Part I: Metals” Praktische Metallographie. 8:547-65. This plot clearly shows why sample prep for EBSD needs to be meticulous. 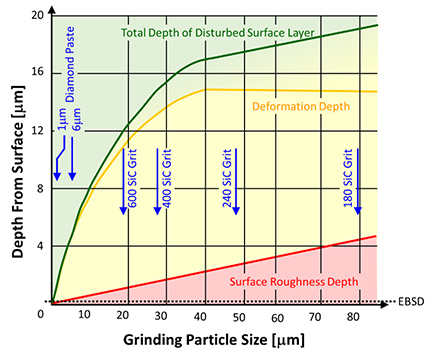 My longtime colleague, Matt Nowell, did a nice study comparing by grinding two samples, one ground to 240 grit and one to 1200 grit. He then cross-sectioned these samples and carefully prepared the cross-sectioned surfaces. Matt then did OIM scans on the two surfaces. 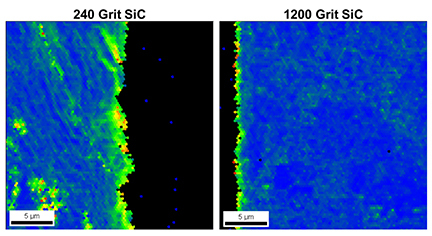 Using a Kernel Average Misorientation (KAM) map, the degree of deformation in the 240 grit sample is clearly more pronounced that in the 1200 grit sample. Matt and I have always wanted to repeat this measurement for more grits and materials but have never found the time to pursue it again. Many times, students who have asked me “which grinding and/or polishing steps can I skip?” Or, “how many times can I really use a grinding paper?” (I remember as a student we got one paper for each grit for the semester and we would hang them from a wire with clothes pins in the sample prep lab!). Or, “can’t I just do the final grinding step for a longer time and skip the coarser grinding steps?” One thing we’ve learned on our own and in conversations with the sample prep vendors is that the recipes developed with several steps for what intuitively may feel like short times really are the steps that lead to the best results -basically confirming the plot shown above. The improvement in cameras, image processing and particularly NPAR™ should not be used as an excuse to take shortcuts in sample prep. While it may be possible to get patterns and reasonable maps, are you really looking at the representative microstructure of interest or a distorted version resulting from deformation induced by sample prep? I believe EBSD has had a positive impact on the metallography community. EBSD has forced us to be more careful in sample preparation over that typically done for light microscopy or even scanning electron microscopy. Hopefully that extra care has resulted in more representative microstructural characterization.